• All Purpose & Multi Purpose Cleaners offer you a universal solution for your entire home, so you don't need hundreds of cleaners under the sink! 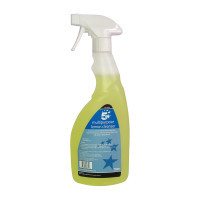 Introduced in 2015 the 5 Star™ Facilities range is your dependable and affordable range of cleaning and janitorial materials. We have also extended the 5 Star™ Facilities brand into our First Aid kits, ensuring that you can price compete across the Facilities sector.